NOTE: Before you begin, make sure the router and the computer with the Adapter installed are in the same room. 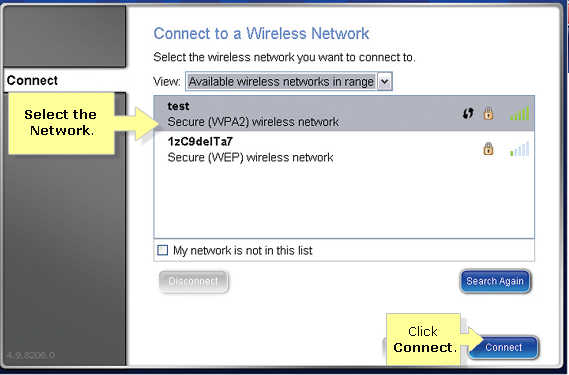 Select your wireless network name in the Connect to a Wireless Network screen, and then click Connect. NOTE: The network name used for this example is “test”. 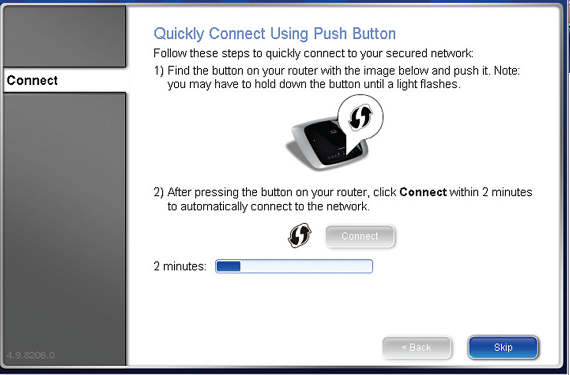 When the Quickly Connect Using Push Button screen appears, press the router’s Wi-Fi Protected Setup button . 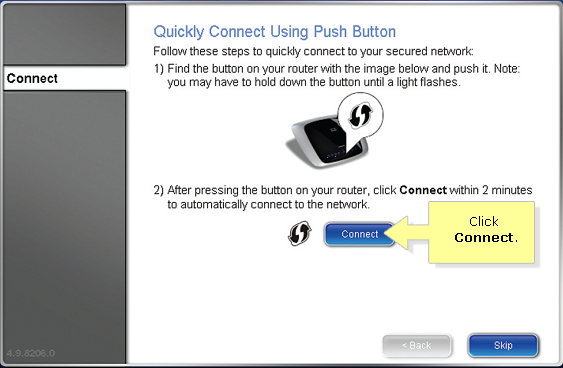 NOTE: If your router does not have this Wi-Fi Protected Setup button, click Skip and go to Enter the Adapter’s PIN Number, for information click here. 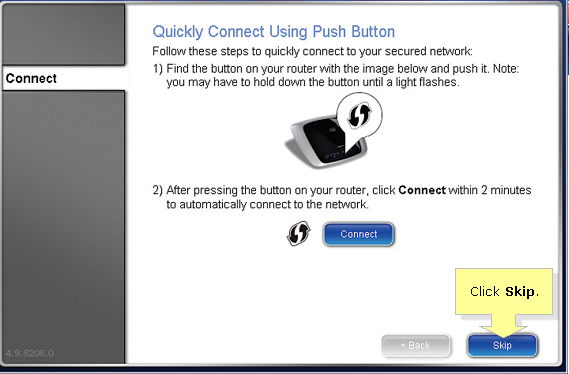 Within two minutes, click Connect on the Quickly Connect Using Push Button screen. Wait for about a minute for the adapter to connect to the wireless network. NOTE: If the connection cannot be set up, a Registration failed error message will appear. 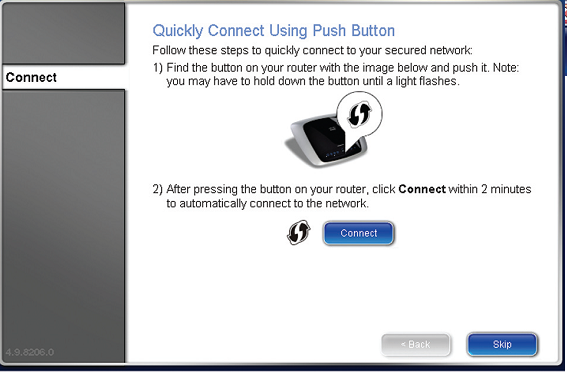 When this happens, click Connect to try again using the Wi-Fi Protected Setup button, or click Skip to try again using the Adapter’s PIN number, and then go to Enter the Adapter’s PIN Number. For information on how to do this, click here. When the Connected to Your Network screen appears, click Remember this network if you want to save your network’s settings. Then, click Finish to exit the Wireless Manager. 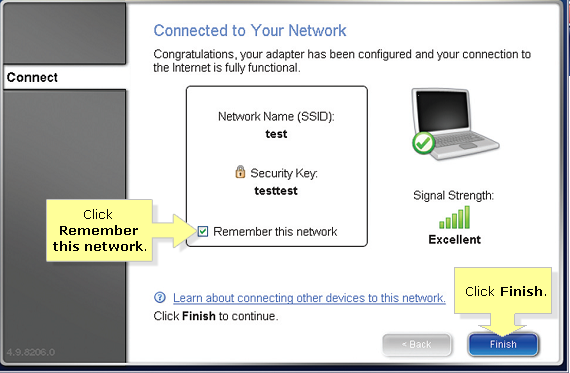 You should now have your computer connected to your network using the Linksys Wireless Manager.